The Bulls are averaging 117.7 points per game in their last 12 games, fourth in the NBA with a net offensive rating ranking seventh in the league. It's not mystical and somewhat mysterious like the triangle. It lacks the showmanship of Magic and Kareem's Showtime or the alacrity of Mike D'Antoni's Seven Seconds or Less. There's not quite the precision of Stockton to Malone. But Robin Lopez with the hard, wide screen and roll into the post and Zach LaVine with a slash, dash and often a splash into the basket is becoming one of the most effective offenses in the NBA. With the acquisition of Otto Porter Jr. in early February, the Bulls as they prepare for Detroit Friday have turned into not only a winning team at 7-5, but one of the league's top 10 offenses. The Bulls are averaging 117.7 points per game in those last 12 games, fourth in the NBA with a net offensive rating ranking seventh in the league. Even their net offense against defense is a reasonable 12th in the NBA, all marks that would suggest a moderately high level playoff team over a season. And that's even before some more expected additions from the NBA draft and free agency. And yet it's all so simple, if also surprising. Because it revolves around the almost forgotten Lopez and the sometimes doubted LaVine. But it's become the go-to play for the Bulls, a set used perhaps 50 or 60 times every game. So easy to identify; equally difficult to combat. Lopez squares up about a foot or two above the left elbow to set a screen for LaVine, often coming up from the baseline. LaVine might dribble past, get a pass from the opposite guard or a handoff from Lopez. Which is where the play develops and because the 11th year veteran center is so adept at placing his body just in the correct position. Often when setting a screen, a player will merely stand in place (moving when screening is a violation) and allow the guard to drive past. Often big men perform what is considered a brush screen, which is getting in place for a screen and sort of brushing the defender and rolling. Big men like Dwight Howard would often perform almost that fake screen to roll in order to get the basketball. What makes Lopez' screens so special and unusual is the way he will square up facing into the defender chasing and contesting the guard. So as LaVine comes around, there is the seven-foot 280-pound Lopez with his shoulders back essentially stretching several feet across. It makes it virtually impossible to get by him. Even a top defender like Jimmy Butler Wednesday frequently disappeared into Lopez' body trying to defend LaVine in the Bulls win over the 76ers. The alternatives are for the defender to go under the screen, which means dropping off and leaving a wide open jumper for the guard. But if the player defending Lopez moves to cut off LaVine, Lopez simply slips deep into the lane and is virtually unstoppable against a smaller guard even like Butler. And LaVine with his amazing quickness has a huge advantage against a slower big man who was defending Lopez. Teams tend to switch screen/roll plays in this era. Which also gives LaVine a big advantage. It's almost impossible for a guard to get over the screen in and remain in front of LaVine the way Lopez positions himself. Especially with the series of post spin moves and his hook shot that Lopez has modernized from the 60s, Lopez is averaging 16.9 points since the trade. It is almost double his career scoring average and about triple what he was averaging earlier in the season. 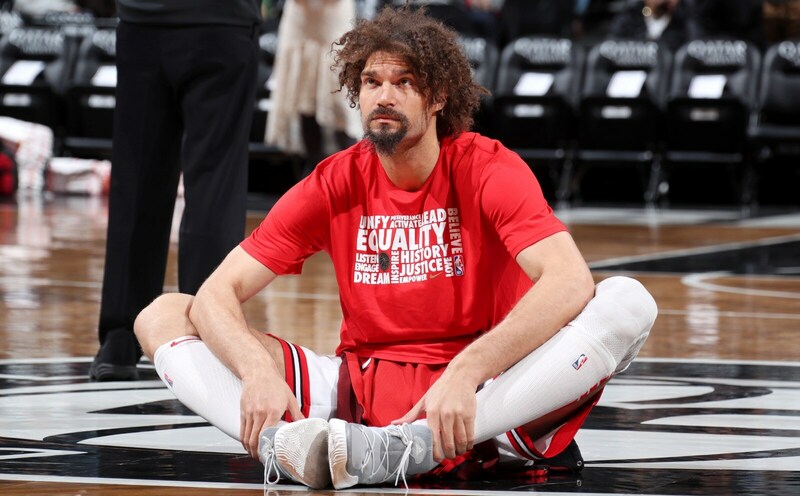 The Bulls seemingly had been phasing out Lopez in the belief that he was too slow for the modern game, which often requires the center to come out or switch to defend shooting big men. But it has worked to the Bulls benefit as teams often don't have big centers. Thus Lopez has been able to dominate physically inside to get off his shot. And especially to screen so effectively that often several sections of fans complain because the court gets blocked out. "Great screener," agreed LaVine. "I know if I get downhill (going toward the basket) and they are doubling me I have a reliable guy who can catch it and score, a seven footer, fake someone four or five times and put it in the cup. The chemistry with Robin is off the charts. He's the best screener I've ever had. He's a vet, does everything right, tries hard on defense, makes up for our mistakes." 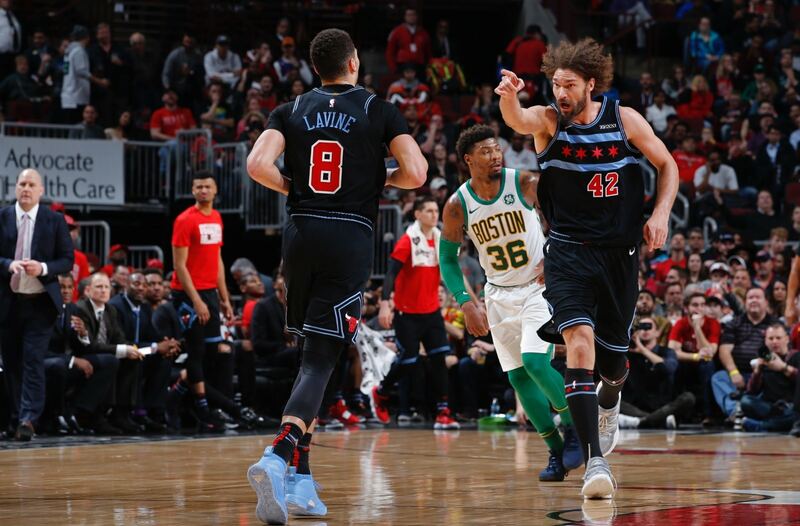 That Lopez would become the hub in the team's offensive wheel is perhaps the most unexpected development of this topsy turvy Bulls season. Though perhaps it is a harbinger for the team as it begins to form the outlines of a contending team. "You've got me on one side and got Lauri Markkanen on the other side, two great shooters," Porter pointed out after the victory. "KD (Kris Dunn) also is a capable shooter. So you have the floor spaced. Zach is really, really good on coming off screens and one-on-one basketball with the big man. And Rolo is good setting it and rolling in the pocket. So you really have a two-on-two game. That's what we want. Teams are going to have a hard time guarding us like that because we space the floor well and the middle is pretty much open for Zach to attack and be aggressive and you saw tonight that's what he did." LaVine's 39 points and 13 in the last five minutes was the difference along with Lopez' team high fourth quarter plus-11 in the plus/minus statistics. Dunn finished the game this time, though it has been a revolving backcourt partner for LaVine because of that shooting element. The way the Bulls spread the floor for that two-man game with Lopez and LaVine is with Porter in the right corner, Markkanen on the left, or strong (ball) side wing, and the point guard in the left corner. So when LaVine turns past the Lopez screen coming right into the middle, he'll be able to pick from Lopez if he's deep enough in the paint, shoot or drive. He can pass to Porter in the right corner in front of him or perhaps a pass and pass back to Markkanen and perhaps swung to Dunn. Though Dunn has been a reluctant shooter and hesitant with threes. Which is why the formation at times features Ryan Arcidiacono with Lopez, LaVine, Porter and Markkanen. Arcidiacono isn't a prolific three-point shooter, but he has a higher percentage than Dunn and attempts more. Thus he becomes more of a threat, limiting his defender from coming into the lane to help against LaVine or Lopez. It's a small sample since the acquisition of Porter. But since then with the starting lineup with Dunn, the Bulls are plus-1 per 100 possessions in offensive rating in the 148 minutes those five played together. Though in just 48 minutes with Arcidiacono, Lopez, LaVine, Porter and Markkanen, the Bulls are plus 50.9 per 100 possessions and have outscored opponents 129-77. Those lineups and combinations will be a crucial ingredient of analysis for the rest of the season, which is a big reason why the Bulls are not experimenting with losses for draft position. When Lopez came to the Bulls in the Derrick Rose trade in 2016, his primary offense was a mid range jump shot. It was remarkably accurate and he averaged in double figures his first two seasons. But he began to abandon that shot last season as his scoring average fell to 8.4 in limited play with rotation alterations. He wasn't a part of the offense early this season as the Bulls were committed to rookie Wendell Carter Jr. at center. But with injuries and the ineffectiveness of Cristiano Felicio, Lopez moved back into the rotation. He played little after Jim Boylen replaced Fred Hoiberg as head coach in early December. But with the acquisition of Porter, Lopez not only cemented a role in the lineup, but he became something of the fulcrum of the offense as the pick and roll has become the offense of choice all around the NBA. Lopez isn't a big rebounder because he doesn't always react quickly. But he's smart about position, snatches rebounds with ferocity and keeps his hands high. He has a low dribble to protect the ball effectively. But it has been his relentless movement setting screens which has enhanced the offense. The Bulls occasionally post up Markkanen, though he's not strong enough yet to be consistent. They will run in transition, but there now are fewer of those stagnant isolations. It's Lopez above the left elbow to free LaVine or shifting to the right when the ball moves and back. Once Lopez sets the screen and LaVine uses it, Lopez with long strides will make a loping move into the lane. His position then often is so deep he needs just a spin or two, a clever move that avoids a travel, before almost always shaking his defender. As long as he is about three or four feet away, his hook shot is unusually accurate. Lopez doesn't pop out much anymore for shots, though he has made six of 23 threes this season. He has made all 10 of his career threes the last two seasons. His three-point shot seems fundamentally sound, so it likely can improve even was he's been primarily a defensive player throughout his career. Though he has been most effective with that interior play that now opens up the perimeter even more for shooting. Lopez even credited former Bulls center Bill Cartwright for his improvement as a screener when Cartwright was his coach as an assistant in Phoenix. "There's been a lot of coaches, a lot of guys at Stanford, a lot of guys at my high school," Lopez said Wednesday night. "A lot of guys in the NBA. Bill Cartwright comes to mind, a lot of people I've learned from. I'm just playing off a really talented player. He's (LaVine) been a very intelligent player for us. I'm just playing off of that. I'm fortuitous to be doing that. It's Zach's basketball IQ at making plays for guys coming out of that pick and roll. He's been so smart at that. When Zach lures the guy into going one way, I gotta find the angle and nail him. "It's my job," said Lopez. "It's rewarding. I like contributing to the team, contributing to the game however I can." Lopez and LaVine, Inc. They've been sealing the deal.